The Leonardo models were originally developed in the United States as a travelling exhibition by IBM, and arrived at University of Technology Sydney in 1994. The exhibition toured extensively around Australia and South East Asia before finally returning to the custodianship of UTS. Over the past two decades, the models have remained extremely popular, especially for school visitation. The Leonardo models were restored in 2007 and displayed in the UTS Tower in 2008, when one was also featured in the Biennale of Sydney exhibition. 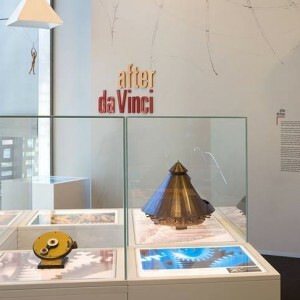 After da Vinci is the latest exhibit for this collection was developed with museum design specialists Bannyan Wood and explores links between Leonardo’s inspired drawings and more contemporary inventions. The exhibition is in four sections spread across different floors of the Faculty of Engineering and IT building [CB11]. For more information about the exhibition and the models please visit the dedicated After da Vinci website.